Our sister site, Cool Places, has teamed up with Tented Trails to offer one lucky couple a three-day guided walking holiday of the majestic Pembrokeshire coast! The prize includes two nights at Ty Canol Farm Camping and Fishguard Bay Camping in a fully-equipped, pre-erected Terra Nova tent. Meals are taken care of, made using the finest local produce. Your luggage will be transported to each site before you arrive, while maps and guidebooks are also provided. Tented Trails offer alternative self-guided walking holidays in stunning Pembrokeshire, minus the stress of lugging all your gear around. Tented Trails take care of everything for you; they organise your stay at a range of Cool Camping-approved sites, pre pitch your fully-equipped tent, and arrange the food and luggage for each night of your trip. 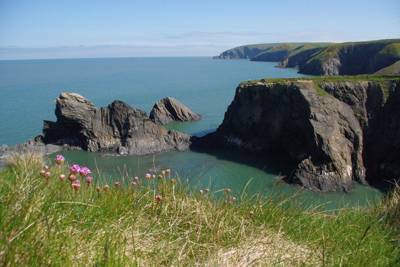 So all you need to do is enjoy the Pembrokeshire Coast Path and soak up the epic views. 1. This promotion is open to UK residents, excluding employees of Cool Places Ltd; Punk Publishing Ltd & Tented Trails, their families, agencies and anyone else directly connected with the promotion. 3. Competition Details. In order to qualify for this competition, entrants must email enquiries@coolplaces.co.uk with the full answer to the question stated on the competition page. The competition will begin at one minute past midnight (00.01) in the early morning of Monday 2nd September 2013. Any person who emails the answer before that time will not be eligible. 3. 1 By entering this competition your email address will automatically be added to the Cool Places newsletter mailing list and will be eligible to receive the Cool Places monthly newsletter, which contains instructions on how to unsubscribe. 3. 2 The closing date for this promotion is midnight 16th September 2013. Any person who signs up to the Cool Places website after this date will not be eligible. 3. 3 We accept no responsibility for damage or loss resulting from misdirected or incomplete sign ups arising from computer malfunction, viruses, bugs or telephone malfunction or other such causes. We are in no way liable for the reproduction or indirect access via third party websites which misstates or omits any of the information or terms and conditions connected with the promotion. 3. 4 The winning person will be selected at random on 17th September 2013. 3. 5 The winner will be notified via email within 28 days. The name of the winner will be published on the www.coolplaces.co.uk website, and may be used in other marketing emails and social media sites. 4. Prize Details. The prize consists of three day (two nights) holiday for two people with Tented Trails. The prize includes a one night stay at Tycanol Camping and a second night stay at Fishguard Bay Camping in pre-erected tents, although different Tented Trails campsites can be chosen if preferred, subject to availability. The prize also include food for two nights. All details of the prize holiday are subject to availability. The prize holiday must be booked and taken in either 2013 or 2014. If the holiday is not booked and taken before 4th January 2014, then the prize will be forfeited. The prize holiday does not include travel to or from the start and end location of your walking holiday. 4. 1 The prize may not be used in conjunction with any other, offer, voucher or discount. 4. 2 Usual Tented Trails terms apply. 4. 3 No cash alternative will be offered. 4. 4 In the event of unforeseen circumstances, the competition promoters reserve the right to offer an alternative prize of equal or greater value should the specified prize become unavailable. 4. 5 The promoters reserve the right to cancel or amend without notice the terms of this promotion and any Prize issued in the event of major catastrophe, war, earthquake or any actual or anticipated or alleged breach of any applicable law or regulation or any other circumstance beyond the promoter’s control. 4. 6 The promoters cannot be held liable for any failure by third parties to fulfil their obligations or for any acts or omissions outside their control. However, the promoters will endeavour to minimise the effect of any such failure. 5. By entering this promotion all participants will be deemed to have accepted and be bound by the rules. All entry instructions form part of the rules. 5. 1 By entering this promotion the winner agrees to any publicity connected with the promotion. 5. 2 Any breach of these Terms and Conditions will result in a forfeit of the prize. 5. 3 This promotion is governed by English law and is subject to the jurisdiction of the English Courts. This competition is promoted by Cool Places Ltd and Punk Publishing Ltd, 3 The Yard, Pegasus Place, London SE11 5SD.